What follows is a summarized and paraphrased overview of the contents of the plenary session on day two of the conference. Theme: What are the Moral and Ethical Implications in Interdisciplinary Holocaust Education? Gender studies: Women experienced unique horrors during the Nazi terror: slave labor, medical experiments, the loss of husbands and children. Children were the most vulnerable: 1.5 million children were killed during the Holocaust. Due to their special role in society, women are found at the focal point of events throughout the Holocaust years. Literature and Arts: Primo Levi, a Holocaust survivor from Italy (biography at http://www.giotto.org/piccolomini/levi.html) used the written word to describe the horrors of Auschwitz. According to Levi, arts and literature keeps the memory of the Holocaust alive and helps us grieve the loss. Religious studies: Even though the Holocaust had a racial basis under Nazi ideology, religion is a central theme in Holocaust studies because the victim comprised a religious group, even though religion was not central to Hitler's Aryan vision. The crucifixion is to the Christian as the Holocaust is to the Jewish people. Without the crucifixion, there is no Christianity. Without the Christian, there is no Holocaust since religious anti-Semitism was the soil in which Nazi racial ideology was planted. Therefore, without the crucifixion, there is no Holocaust. It generated a competition between the Jewish and Christian religions. The Holocaust is a source of shame and anger for Jews who must operate in a dominantly Christian world. The way the Jews are portrayed in Mel Gibson's movie the Passion of the Christ shows an insensitivity to the Christian accusations against the Jews since the time of Jesus. After Treblinka, the value of human life must be protected and respected. 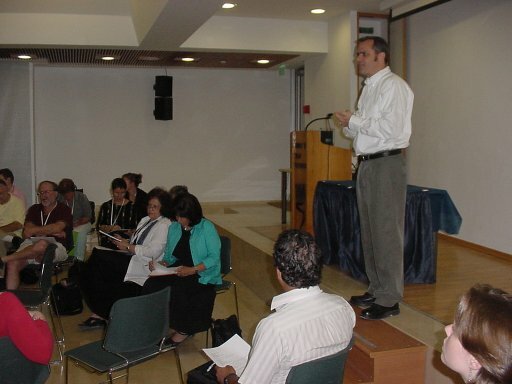 Holocaust Teachers Resource Center Speaker: Dr. Michael Berenbaum, University of Judaism, Los Angeles (Author: The World Must Know, Back Bay Books, 1993). Sixty years after the Holocaust, you can see the world reflects the experience in CNN, movies, and books on that and related topics. The relevance of Holocaust education in the post-9/11 world is that we must be able to connect the dots before a major historical catastrophe. The Holocaust informs our discernment in differentiating information from knowledge. We use the Holocaust to help us understand atrocious such as the Abu Ghraib scandal. How did the average German citizen become caught up in the Nazi murder machinery? What was the impact of ideology and conscience? Are these elements still in opposition in places like Bosnia and Iraq or any place the power of the state has sway over average citizens who think they are serving their nation in a time of military or social conflict? The question of obedience comes into the light in modern society when we look at placed like Mi Lai. The moral struggle of righteousness can be seen in the debate over the "Righteous Gentiles" and their motivations for refusing to obey the Nazi state. These are the rescuers, many of whom did not see themselves as heroes, but rather, they are the embodiment of the Yiddish idea of the "mensch," the good human being. They saw themselves as ordinary people acting in extraordinary times. The themes of the Holocaust become evident in such modern disciplines as medical ethics. The Nazis inflicted horrible medical experiments on those who were unknowing or unwilling to comply with their twisted agenda. In today's world, we call this issue "informed consent." The Holocaust has become a popular method for understanding popular culture. Since the Shoah is the ultimate in everything, using it calls for a sense of responsibility,. As Dr. Roth stated in his address, "handle with care." But it works. Students react to the Holocaust in unique ways. Teachers are having increased success in reaching students, even those of previously difficult populations. It calls into question and puts directly into the front of the classroom contemporary issues of bullying, stereotyping, pluralism, and tolerance. The Shoah was an atrocity, not a tragedy. Why? Because it was a choice, not a fate. The perpetrators were not destined to commit acts of horror. They chose to engage in those behaviors out of their own free will. And while the will of the victim was limited by "choiceless choices," many of them chose to stand up to their killers knowing it would bring about their end. Survivors symbolize heroism and resilience, not just of the Jewish people, but of all those who face oppression against overwhelming odds. The Shoah asks of Jews and of the world critical questions of inclusion and exclusion. Jews were excluded from the mainstream of German society. The Nazi plan was to exclude the Jews from human existence. Now the state of Israel exists as a Jewish state with an Arab minority and Palestinians living under military occupation. When we look carefully at the Shoah, myths regarding inclusion and exclusion are destroyed, and conventional wisdom regarding human behavior comes into question. Unfortunately, history has no tool to measure the interest of the person studying it. The world can suffer from "Holocaust fatigue," where the guilt and work that it calls for become tiring, so we deny our need to engage in that work. Powerful segments of Jewish society are resistant to accepting the meaning of Shoah, which calls into question the appropriateness of Jewish traditions of exclusion and cohesiveness. The Jewish community must offer the Shoah up as a universal truth, not just one that applies to the community which it benefits. The Holocaust led millions to question their own faith, both Jewish and Christian. Can God still exist in the darkness that was the Holocaust? The Holocaust presents to one's religious faith a cycle of revelation, redemption, and creation. Several Messianic movements within Judaism have capitalized on the Shoah as a marker for the coming of the Messiah. The Lubavitch movement (see website http://www.chabad.org/generic.asp?aid=36226) among others constitute a major force in Judaism and have helped direct Jewish thinking on the Holocaust. The movement was not a reaction to the prosperity of the Jewish people since the Shoah rather than a reaction to the tragic aspects of the Shoah itself. For the Lubavitchers, the Holocaust was a preparation for the Jewish people to be purified and strengthened from suffering, but it was not a punishment for anything the Jews did in the sight of God. To many Jews, God revealed Himself from within through suffering along with His people. When the Jews suffered, God suffered along with them. Dan Napolitano, United States Holocaust Memorial Museum, Washington D.C.
Dan placed chairs in circles until they reached the center, where two chairs faced east and west and two more faced north and south. Those who wish to contribute to the discussion may do so by taking one of the center seats. They may stay as long as they link until a person taps them on the shoulder. They may leave the center on their own accord. Individuals have three opportunities to speak. If no one says anything, think quietly. The conversation went calmly and with civility. One college educator made the point that the Holocaust is sufficiently compelling that no additional methodology other than traditional teaching methods is needed to grab students' attention. If a teacher fails to do so withy the Holocaust as the topic, they should find another profession. Not all agreed. We know students are growing up in the MTV-age of multi-media, and that it takes innovation to make the topic relevant to students. I added that we all experience "little Holocausts," that we are all faced with situations where intolerance and prejudice led us to make poor decisions. I qualified my statement by saying that few of us are faced with situations that lead to genocide, but few suspected that genocide would be the end result when Hitler ascended to power in 1933. One teacher felt that I was belittling the memory of the Holocaust by using the adjective "little." I tried to explain my meaning to her after the discussion. Only during the next day's sessions did she come up to me and say she understood what I meant. She wanted me to use the term "crossroads" to show that each of us are faced with the moral dilemma that many faced during the early phase of the Holocaust before the Nazi state was able to implement its plan of segregation, discrimination, and extermination. Afternoon workshops: Here I gave my workshop on using the Internet to teach the Holocaust. 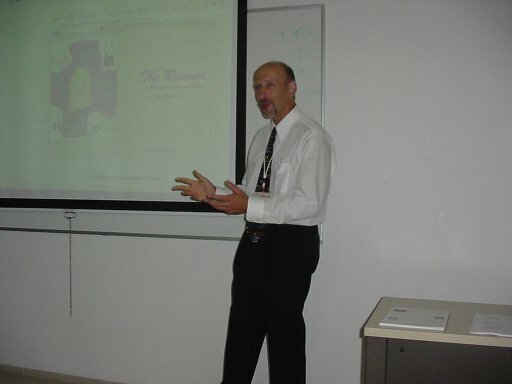 (Link opens a PowerPoint presentation of 1.95 MB) The chief web designer for Yad Vashem came to visit and hear my presentation. before the attendees came in, she showed me two pages of testimony that she had found on the Yad Vashem database. My website had provided her with the information she needed to do a search. She gave me information on my maternal grandfather, Abraham Rodrigues, who died in Auschwitz. She also provided a new insight ion my father's first fianc�e, Hetty Winkel, whom we thought had died in Auschwitz, but the documentation showed that she was gassed in Chelmno, another one of the extermination camps. Both pages were submitted by people I had never heard of. One was a distant cousin living in Australia. I thought the presentation went well, but I felt rushed because I only had 45 minutes. I skipped through important parts of the PowerPoint section, and I used the Internet to show some of the student projects we had developed. I had about 7 or 8 people attending, which was a disappointment. 8,000 miles for 45 minutes to a handful seemed to be not much juice for the squeeze, but I remembers that the experience was much greater than the presentation.